Fully weather-proof 5mm thick PVC disc. Virtually shatter-proof & maintenance free. 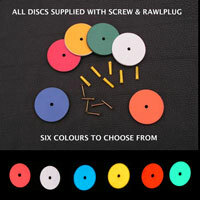 Each disc supplied with screw. Optional Rawlplug for fixing to walls. Much better light transmission than moulded reflectors. NB. Large quantities may have longer delivery times. Buy these reflectors pre-drilled, ready to fix with screw provided. These reflective markers are ideal for high-lighting potential hazards, roadside marker posts, driveway entrances etc.